While you’ve heard about our GEOPowered Cloud before, I wanted to step back and provide some perspective on the vision behind this offering. At GEO Jobe, we have a deep belief in the value of GIS technology. Central to our mission is offering products and services that enable clients to fully realize these benefits – across their organizations. Frankly, this is why we’ve embraced enterprise GIS and the Web GIS implementation pattern, because they provide the building blocks for delivering the value of GIS to the masses. While all clients can benefit from enterprise GIS capabilities, we’ve identified certain bottlenecks (cost, infrastructure, knowledge) that act as barriers to implementation and thus barriers to our mission. To overcome these challenges, we’ve created our GEOPowered Cloud – A platform offering shared and dedicated hosting supporting ArcGIS Online, ArcGIS Enterprise and Esri partner solutions. Let me un-pack each of these below. To date, the hybrid approach to ArcGIS Online is still the most popular implementation pattern as it provides clients with the best of Esri’s enterprise products (ArcGIS Online & ArcGIS Enterprise). We find this implementation pattern especially valuable for enhanced GIS data integration, advanced map production, seamless data flow between ArcGIS Desktop and Web GIS users, etc. The problem is that for smaller clients, the cost associated with buying ArcGIS Online, ArcGIS Enterprise, infrastructure and implementation services tends to take these benefits out of reach. 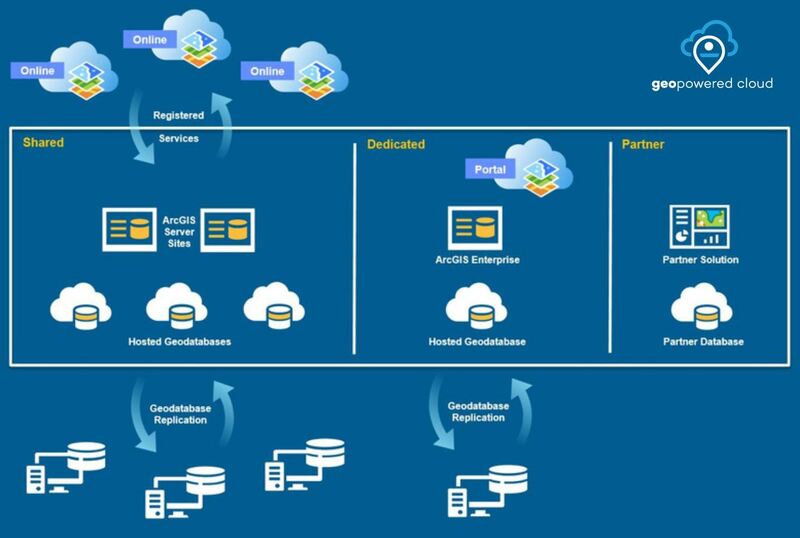 To address this, our GEOPowered Cloud – Shared Hosting subscriptions provide ArcGIS Enterprise capabilities (paired with your ArcGIS Online subscription) for a fraction of the cost. Think “The hybrid approach to ArcGIS Online via a SaaS model” – all priced by the number of users. While shared hosting is great for certain clients, there are an equal number of organizations that have full access to ArcGIS Enterprise through Esri license agreements (ELAs, etc.). For these clients, cost is not the barrier, rather enterprise infrastructure and/or knowledge. To meet the needs of these clients, our cloud needs to adapt and we’ve done just that. Our GEOPowered Cloud – Dedicated Hosting subscriptions are designed to provide clients with a deployment platform for their dedicated ArcGIS Enterprise system. Whether paired with ArcGIS Online or fully configured with Portal for ArcGIS, our dedicated hosting subscriptions will adapt to your architectural needs. You’re guaranteed the full power of ArcGIS Enterprise with a lower implementation cost and less ongoing responsibility. As clients implement and start using enterprise GIS capabilities, it’s natural that they’ll want to extend the ArcGIS platform with great third-party solutions offered by members of the Esri Partner Network. This brings the best of both worlds together and we want to enable that. As a result, we’re excited to announce support for hosting and integration with third-party solutions offered by Esri business partners. While the implementation details will vary by product, we accommodate dedicated hosting and/or integration with shared or dedicated ArcGIS Enterprise resources. This is especially valuable for partners targeting accounts that fall into either the shared or dedicated hosting categories above. 2017 brings a new year and a renewed excitement around our GEOPowered Cloud offering. In alignment with our motto “The Power of GIS, Simplified”, we will continue to meet our clients where they are, offer enterprise GIS deployment options and work alongside them to change lives through the value of GIS. If you’re looking for a partner in your enterprise GIS venture, we’d love to work with you. For more information about the GEOPowered Cloud and how your organization can benefit, CLICK HERE. We’re glad to discuss options with you!